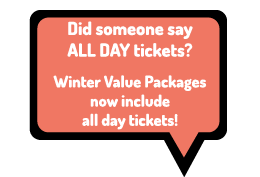 Enjoy the convenience and affordability of our Winter Value Packages! Get away to the mountains and splendor in the savings on lodging, lift/slope tickets, rental equipment, even lessons for the whole family – all without the peak-season crowds. You’re guaranteed savings of 30-40%. Winter Value Package guests receive multiday tickets good for ALL skiing and snowboarding sessions during your stay. Reservations must be made, and deposit received at least 7 days prior to arrival to receive discount. Rates vary between accommodation centers. Discounts do not apply on Martin Luther King and President’s Day Monday or during holiday period. Children 4 & under and seniors 70+ receive complimentary lift/slope tickets, therefore Winter Value Package rates do not apply for kids 4 and under or seniors 70+. When renting equipment, you must choose either skis or snowboards. Exchanging equipment is not allowed. A valid ID will be required for every adult while at Sugar Mountain Resort to rental equipment and may also be used to validate tickets. Please bring your IDs every day. There is a $400 deposit (cash or credit card), payable in the snowboard shop, for all snowboard rentals. Program not for groups of 15 or more. Rates are subject to change without notice. Package rates are per person and include lift/slope ticket, equipment rental & lodging. Weekend Packages are available Friday, Saturday & Sunday, early and late season only. Early and late season Weekday Packages are Monday through Friday and Midseason Weekday Packages are Monday through Thursday only. Lodging policies including cancellation policies will vary between management companies. Packages are subject to availability. Some restrictions may apply. A security deposit for lodging is required and is refundable providing the unit sustains no damages and is left tidy. Pets are not allowed. Lodging rates are based on the rated occupancy for each unit including applicable linen/cleaning fees and taxes, then broken down to show the “per person” cost of packages. A refundable security deposit for snowboard rentals is required, and is payable to Sugar Mountain Resort at time of rental. Group Lessons are available for an additional $17 per person at Ski School. Private Lessons are available for $45 for the first person, plus $22 for each additional person in Ski School. The children’s Sugar Bear and Polar Bear programs are available for an additional $32, and $67 per day respectively at Ski School (half day or full day). Lessons, as well as the children’s Sugar Bear and Polar Bear programs, are payable to Sugar Mountain Resort with a valid Winter Value Package slope/lift ticket. Call or visit our Ski School if you intend to enroll your child in the Sugar Bear or Polar Bear programs. Advanced Registration is required. When renting equipment, you must choose ski or snowboard. Exchanging equipment is not allowed. Please read how to properly attach your ticket/slope pass.